I remember when I first picked up “This Book Will Change Your Life.” One of my best friends from college had purchased it and showed it to me and I was immediately in awe. The year was 2004. I was trying to start off the year right by following this book. Each day you are given a totally random – and sometimes completely outlandish – daily task to complete. The author snarkily claims that by doing each of these instructions will expand your life, invite you to try new things, and be more open minded. Technically, it could. Some of the objectives are truly ridiculous. (For example, go through the day without your sense of sight.) I read through the pages that I had completed, all those years ago. A lot of them I had skipped, writing: “Yeah I’m not doing this.” I completed the pages until Day 85 and stopped. The task? I remember putting this off several times. It haunted me. Why was I afraid to do this simple task? I think at the time I felt that it would make me look like a crazy person in public. Maybe I needed someone to come along as I did this. I don’t know. All I know is, it took me 14 years but today I was ready to do it! I’ve been going through some changes in my love personal life, and thought that today this would be a therapeutic activity. I’ve been reading a lot of books about self love and today was exploring the idea of letting go of resentment. 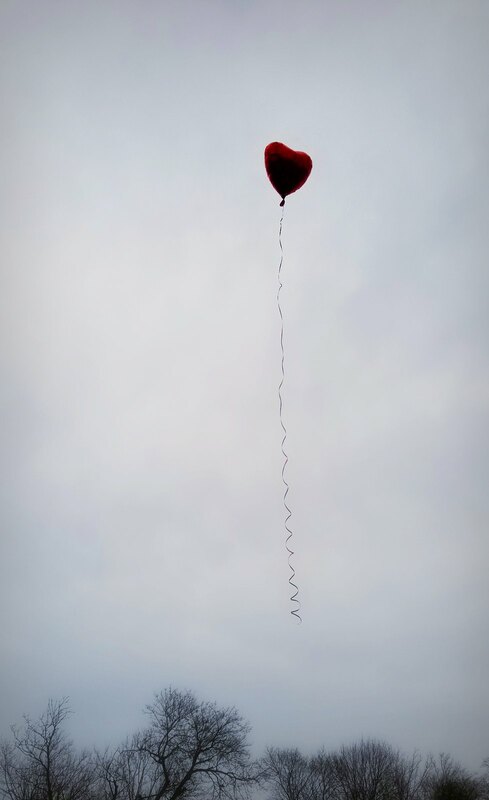 What a perfect fit – I decided to get a red heart balloon and use it to symbolically let go of my grudges and resentments towards the male species that hold me back in new relationships. Plus the fact that it was raining made the whole thing seem more emo, which was fitting.